* New generic ipod touch first generation battery. * Each battery is 100% tested before shipping and in excellent working condition. 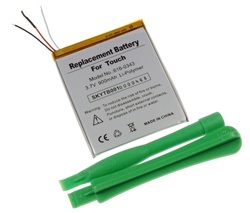 Battery Type: Li-Ion (Lithium Ion) Polymer battery with premium cell. * Compatible with iPod Touch first Generation 8GB, 16GB and 32GB.